The GrowIT Greenhouse-in-a-Box<sup></sup> with Easy-Flow roll-up side vents delivers quality construction, quick and easy assembly, and best-in-class value. Ready to build out of the box, the GrowIT Greenhouse-in-a-Box<sup></sup> with Easy-Flow features a powder-coated 1-3/8 in. steel frame with ShelterLock steel stabilizers for added strength and durability. The translucent, ripstop cover is waterproof and UV-treated, providing enhanced illumination -- for plant growth and protection. Easy Slide cross rails ensure a snug cover fit while Ratchet Tite tensioning provides solid cover anchoring to the frame. Easy-Flow side panels and zippered half-moon end-panel vents provide airflow and temperature control. 6 x 8 x 6 ft. 6 in. peak design for growing plants, starting seeds and extending growing seasons. Patented metal ShelterLock stabilizers for added strength and durability. The Palram Balance 8x12 Greenhouse provides you with a spacious, aesthetic and durable greenhouse, and your plants with optimal nurturing conditions. It features two types of virtually unbreakable Polycarbonate panels, creating an ideal combination of sunlight transition, heat insulation and safety for all your gardening needs. The large work-space and wide double door provide the most enthusiastic gardener plenty of growing room with enough to spare for seeding and storing tools and supplies. Powder coated aluminum frame with internal, strong support beams and rust-resistant perimeter steel base in a forest green finish, provide protection against strong winds and heavy snow load as well as for adding structural support, stability and alignment. The Palram Balance 8x8 Greenhouse provides you with a spacious, aesthetic and durable greenhouse, and your plants with optimal nurturing conditions. 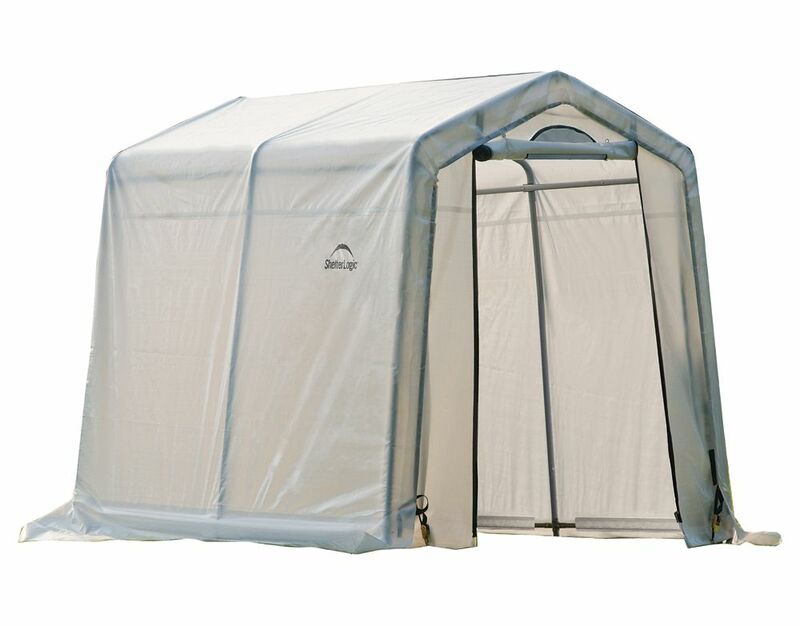 It features two types of virtually unbreakable Polycarbonate panels, creating an ideal combination of sunlight transition, heat insulation and safety for all your gardening needs. The large work-space and wide double door provide the most enthusiastic gardener plenty of growing room with enough to spare for seeding and storing tools and supplies. Powder coated aluminum frame with internal, strong support beams and rust-resistant perimeter steel base in a forest green finish, provide protection against strong winds and heavy snow load as well as for adding structural support, stability and alignment. GrowIt Greenhouse-In-A-Box 6 ft. x 8 ft. x 6 1/2 ft. Easy Flow Peak-Style Greenhouse The GrowIT Greenhouse-in-a-Box<sup></sup> with Easy-Flow roll-up side vents delivers quality construction, quick and easy assembly, and best-in-class value. Ready to build out of the box, the GrowIT Greenhouse-in-a-Box<sup></sup> with Easy-Flow features a powder-coated 1-3/8 in. steel frame with ShelterLock steel stabilizers for added strength and durability. The translucent, ripstop cover is waterproof and UV-treated, providing enhanced illumination -- for plant growth and protection. Easy Slide cross rails ensure a snug cover fit while Ratchet Tite tensioning provides solid cover anchoring to the frame. Easy-Flow side panels and zippered half-moon end-panel vents provide airflow and temperature control. GrowIt Greenhouse-In-A-Box 6 ft. x 8 ft. x 6 1/2 ft. Easy Flow Peak-Style Greenhouse is rated 3.6 out of 5 by 7. Rated 2 out of 5 by pmb123 from Nope This "growit" product lasts one to three seasons; no replacement for the cover; it is not durable (zippers catch and rip). Instead of using it as "green house" it ended up being uses as a short term storage. Beginning of season three, one wind storm and it's now at the dump. Rated 3 out of 5 by Mary M from Green house This is my second green house. I'm having the same problem, tearing at the zipper. We had a bad storm and the zipper got completing torn off from the plastic. Not sure to buy another cover. Both covers did not last over 3 years. Rated 4 out of 5 by WSR from Great for my requirements The assembly instructions could have included more written language along with the drawings. The product quality appears good. Will see how it survives the winter. Rated 5 out of 5 by AGH44 from Great for the price! Easy to assemble....we're 70 and had it together in 2 hours. Just went through a storm with the highest winds we've ever experienced in our area and the Shelter Logic held fast. About the only thing it needs is a roof vent. Rated 1 out of 5 by Jerra from Very disappointed I bought this greenhouse, my husband and I were most of the way done with putting it up when we decided to take it back to the store and get our money back. It was so cheaply made. I expected much more. I guess if you want anything of quality you have to spend $800+. Rated 5 out of 5 by Greenhousewoman from Very Sturdy! Great design. Multiple use and GREAT PRICE!!! I am shocked how sturdy this greenhouse is. It has a great design. We just put it up on a second story balcony. Had to modify it but it works. I have not really had a cold season yet but I am certain that it will be as good as any other. The design is smart, it has the right materials (tarp, ventilation, and strength) that we will need for a cold winter. The tarp is made of the right (can't think of name) material for UV lights. I am surprised how we could make it air proof too! So there should be minimum heat loss in the winter. Excited for extended growing season. This also could have multipurpose such as a storage room, tent for winter outside sitting, or like the other guy I can see it as a motorcycle garage. Rated 5 out of 5 by grannydcd from totally serving it's purpose. actually bought this for a motorcycle cover in a limited space. it was pretty easy to put together, as my husband did it mostly by himself, with little help from myself. went together relatively easy after figuring out the parts. only took a few hours. nice and sturdy.